A beautiful Bollywood actress and one of music’s top hit maker, Aishwarya Rai Bachchan and Pharrell Williams are the April 2018 cover stars of Vogue India magazine. 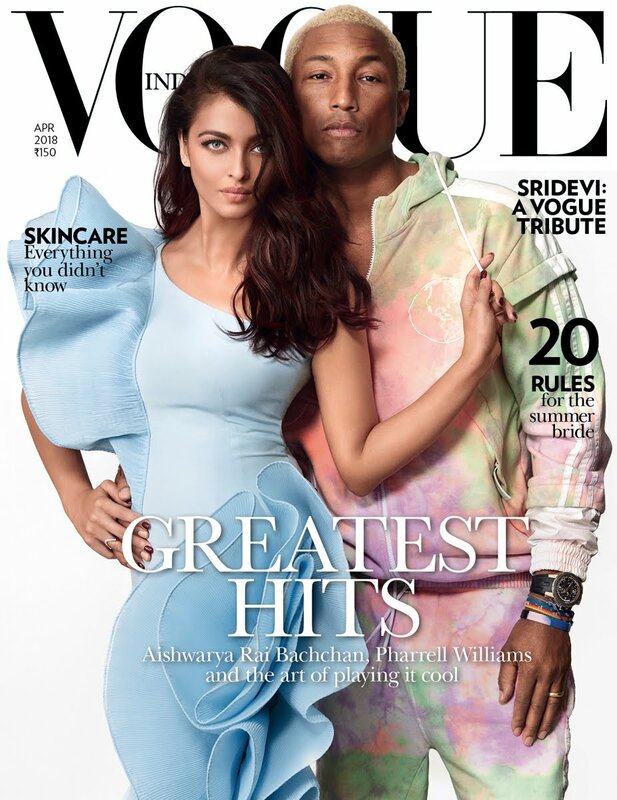 On the cover which was shot by Greg Swales, Aishwarya is wearing a GAURAV GUPTA gown and Pharrell is wearing ADIDAS ORIGINALS. Continue below to read an excerpt from Aishwarya & Pharrell’s interview. For more on their feature, visit Vogue.in and pick up a copy on newsstand. It’s busy! In the superlative. I spend all my time with Aaradhya, and I have one nanny, by choice. I read comments saying, 'Ah, she must have an army of help' and I understand the perception, but I choose this way, which means life is always busy. I respect homemakers for the endless work they do. As far as downtime goes, it’s about perspective—if you believe you’re tired, you will be, so I choose to find pleasure in the moment and experience the present for what it is. I’m a firm believer of the state of the mind, and that’s the means to keep your head above a high level of water, every day. That’s something I’m imparting to Aaradhya—that B-positive is not just a blood group and that everything in life is a learning curve. Experience life in the moment, because you’re going to have to live with your experience. It doesn’t need to but it’s good that it does. I think everything we do should have some sort of message or intention, or else it’s just wasted energy.